CNNFred Guttenberg, father of 14-year-old Jaime Guttenberg, a victim of the Parkland shooting, during an interview on CNN. The father of a Parkland school shooting victim criticised a listening session President Donald Trump held with survivors and family members of victims of school shootings. “I want them to look me in the eye and acknowledge the role that guns play in the hunting of my daughter,” he said. He criticised Trump’s discussion for dodging what he believed was a glaring factor in school shootings. The father of a victim of the Parkland school shooting criticised a White House listening session President Donald Trump held with survivors and family members of the victims of school shootings on Wednesday. Fred Guttenberg’s 14-year-old daughter, Jaime, was killed in the deadly February 14 mass shooting at Marjory Stoneman Douglas High School in Parkland, Florida. During the discussion, Trump weighed the merits of eliminating gun-free zones in schools and allowing armed teachers who have “special training” to access their firearms in schools. 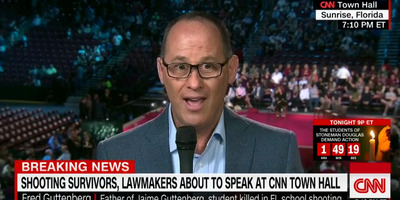 Guttenberg made his statement moments before a CNN town-hall meeting where lawmakers, such as Rep. Ted Deutch and Sens. Bill Nelson and Marco Rubio of Florida were set to engage with participants about the best ways to move forward. “I want to hear people speak truth to action.” Guttenberg said.